The Professionals in International Education has a news item today about iTEP SLATE’s growth in the past year. Since ETS retired their SLEP exam last summer, SLATE, which is made for high school-age young learners, has experienced 300% growth in the number of institutions recognizing it. One school that recently made the switch is Bakersfield Christian High School. Director of Admissions Alice Abril corresponded with PIE editor Daniel Thomas leading up to this article, but wasn’t ultimately quoted in the piece. We’ll take this opportunity to share one story she told about an AP chemistry student who was admitted before Bakersfield Christian started using SLATE. He had the science and math ability, but his English capabilities were still limited such that he often did not completely understand the teacher’s instructions. Throughout the year this had resulted in him not being prepared for tests and turning in homework not completed correctly. He was removed from the class for the remainder of the year. I do not believe this student, who was a sophomore at the time, would have qualified to enroll in the class if we had the SLATE score pre-requisite in place. Clearly, SLATE is more than a replacement for SLEP–it’s an improvement over it. It also has many advantages over TOEFL Junior, another paper-based test available in certain countries. SLATE is comprehensive–it tests reading, listening, grammar, speaking, and writing. Scores for the first three sections are available immediately and the others are scored in less than five business days. The scores, as well as the speaking and writing samples, are available to institutions online. SLATE is more affordably priced than its predecessors and competitors, and also takes less time to administer. 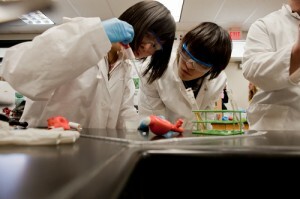 Image: Students in a Bakersfield Christian High School chemistry lab.